In medium bowl, combine chicken, cherries, walnuts, mayonnaise, salt and pepper; mix well. Layer lettuce and chicken salad on 4 slices of bread. Top with remaining bread slices. Dried cherries are deep crimson and have an intense cherry flavor. Use them instead of raisins in breads, desserts, salads and stuffings. Homebaked or purchased nut bread can be used in pace of the multi-grain bread for these sandwiches. 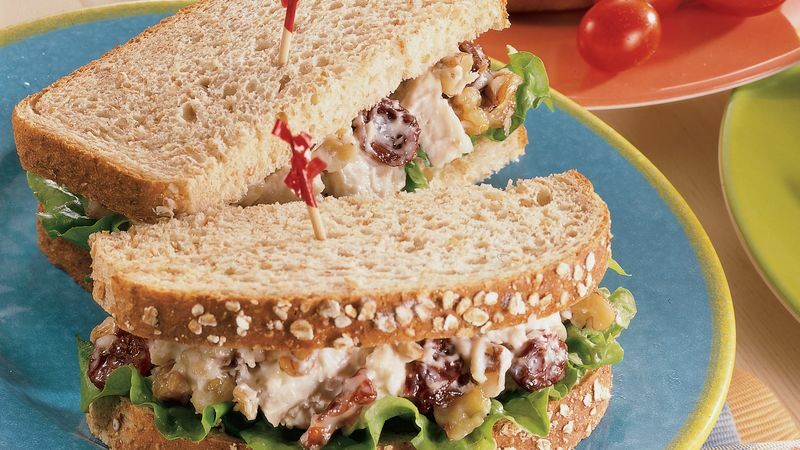 Use one piece of nut bread for each sandwich and serve them open-face, garnished with a walnut half and a dried cherry. For a bit of citrus zing, add 1/2 teaspoon of finely shredded orange zest to the chicken salad. Use only the zest, which is the flavorful, colorful outside part of the peel. The white pith underneath tastes bitter.